"I Never Imagined Using Dance To Reach Street Kids." It is my great privilege to partner with the two organizations described in the guest post by Rebecca Davis, Executive Director of MindLeaps. It's laughable to think that street kids--the hasslers and hustlers that plague many people's daily commutes in Nairobi or Kigali--can show up promptly each morning during a months-long welding apprenticeship requiring discipline and persistence or that being a single link in a fluid chain of choreographed dance is the re-entry point back into the formal education system. Not so fast: Jitegemee in Kenya and MindLeaps in Rwanda are proving that 'street kid' is not a permanent, debilitating state of being, but rather a curve on life's journey to becoming healthy, productive, and empathetic young adults. "I never imagined using dance to reach street kids," said Elizabeth Nzivo. 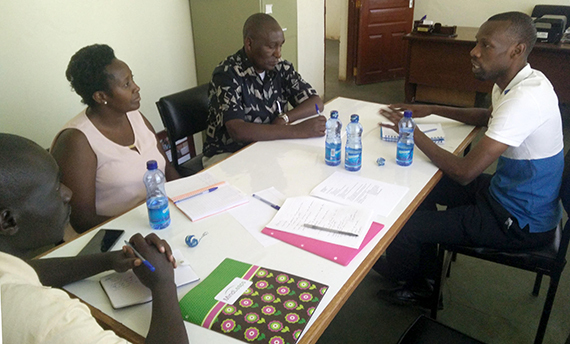 For all of the similarities between MindLeaps and Jitegemee, two organizations working with vulnerable youth in East Africa, we found one important difference--and in that difference is the key to our partnership. Jitegemee is a Kenyan-based NGO that works with street youth in Machakos, just outside of Nairobi. The organization has three different tracks for assisting youth in primary school, secondary school, and vocational training. Of particular interest to MindLeaps was the vocational track that serves 13-17 year olds. Every six months, cohorts of 40 youth go through an intensive vocational training program to prepare them to become independent. MindLeaps Rwanda's Assistant Director Bashir Karenzi visited Jitegemee, a fellow Segal Family Foundation grantee, with me. We are on a mission to find a potential partner organization in Kenya that would like to introduce our dance-based methodology to improve the cognitive and life skills of street children. MindLeaps works with 90 youth daily in Rwanda and 900 youth across our global programs annually. The heart of MindLeaps is a dance program that develops seven skills and measures the change in these skills with specialized software. Like Jitegemee, MindLeaps wants to work with kids who seem to have no obvious entry into the formal education system or workplace. "They need school, but they also need skills," confirmed master teacher Alex Mutiso at Jitegemee. In so many ways, our organizations had found similar solutions to similar programs: a feeding program, an IT program, home visits, school sponsorships, and a growing need to work with girls. 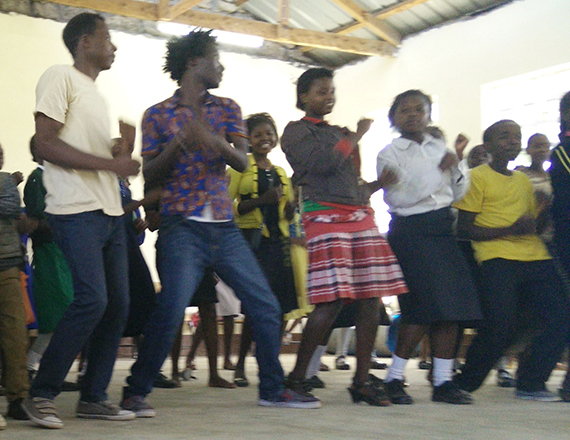 I turned to Bashir and said, "If the issues facing youth here are so similar, then it's likely our dance program could help in the same way we see our kids transform in Rwanda." Is it time to dance at Jitegemee? With the five of us around a table - three Jitegemee staff and two MindLeaps staff - we talked through the challenges and solutions of building stable lives for street youth. Jitegemee has organized several successful "Annual Days," including an Annual Health Day and an Annual Career Day. These would be wonderful ideas for MindLeaps to adopt to provide a wide-range of information to both our youth and community members in a concentrated period of time. Jitegemee explained that sometimes children would come on an ad hoc basis. The MindLeaps' dance program has been particularly good at getting street kids, who are notoriously unreliable, to visit a safe space regularly and on time. We explained that dance is something youth know they are good at, and they love it. We leverage that to turn their enthusiasm and energy into discipline, concentration, and self-esteem. "But, how do you do that with dance?" Elizabeth pushed. "Let's look at a piece of our curriculum," I said. Bashir and I talked through a sample exercise during the "Choreography" portion of a typical class where we engage in a group exercise whereby each child contributes a movement that has to be sufficiently different from their peer, and then we build a phrase with all of these movements. Afterwards, we re-arrange the order of the movements to help build a child's understanding of pattern recognition and sequential processing. This exercise alone tests creativity, self-esteem, teamwork, and memorization. "The 45-minute intensive and technical warm up is also a key part of the class," Bashir added. "This is a way for kids to work out their frustrations in a positive way and then be ready to learn." As it turns out, our M&E system would be particularly adaptable to Jitegemee because the organization is so well-structured--and enthusiastic. With groups of youth cycling through every six months and attending daily from 8:30am to 4pm, implementation of data collection would allow for specific tracking on a regular basis and provide enough information to see potential changes in the cognitive and non-cognitive skills measured. We all agreed that working with street children meant understanding each child's needs and talents. This would be a way to serve the hidden talents in some of Jitegemee's youth while also contributing a quantitative tool to determining a child's progress in mental development. MindLeaps would be thrilled to work with Jitegemee to expand the use of our arts-based approach to Kenya. Through such a partnership, we would learn more about street children in Kenya and the successful vocational training of Jitegemee too. The next step is to determine the availability of local young people to train up in our methodology so that any pilot program could be sustained by local trainers. Our visit, of course, finished up with an impromptu song and dance session with community youth at Jitegemee on a Saturday afternoon!